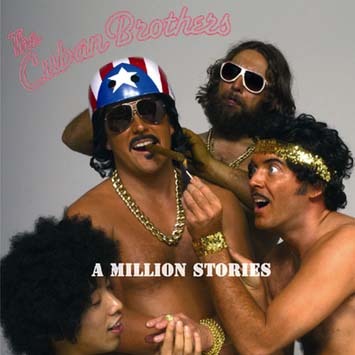 The Cuban Brothers release their long awaited debut single A Million Stories - taken from their forthcoming debut album The A to Z of Cuban Brothers out on the 13th March. This single is a bone fide live favourite and the first of many original recordings from our Cuban heros. Taking it right back, the boys started by storming UK club land with their fresh attitude to partying and performing. Their unique flavour made nights out tasty again and their rise to fame has been meteoric. Their fresh approach to live entertainment whips up a frenzy at every gig they do, whether it be Glastonbury, Bestival, the Gumball Rally, or even their private gigs for the likes of Robbie Williams, Richard Branson and Elton John. Their legendary performance combines music, riotous comedy and sensational dancing - consequently the energy at every show is incredible. A Million Stories represents a new era for the Cubans as they lay down their distinctive flavour. Included in this package are remixes by one man bandito Diesler from the Tru Thoughts stable, and Dutch duo Haaksman+Haaksman. There's also a 'back door' re-edit by The Cuban Brothers' very own Clemente (allegedly the campest man in Havana! ).